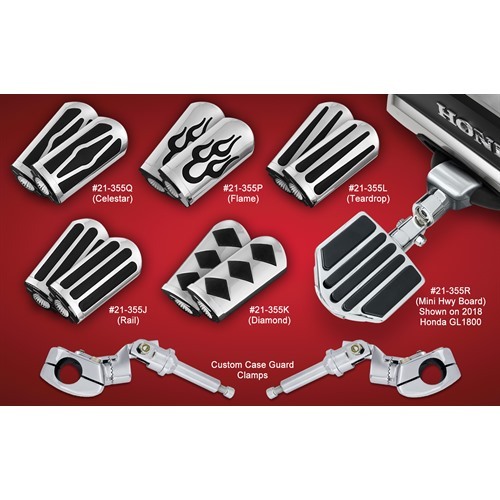 Rice Lake, WI – Do to demand, Big Bike Parts® now offers its custom contoured case guard clamp for the Goldwing with choice of 6 peg styles including their popular Mini Board, Rail, Diamond, Teardrop, Flame or Celestar Peg styles. This allows a true matching look to similar offered styles in driver pegs. 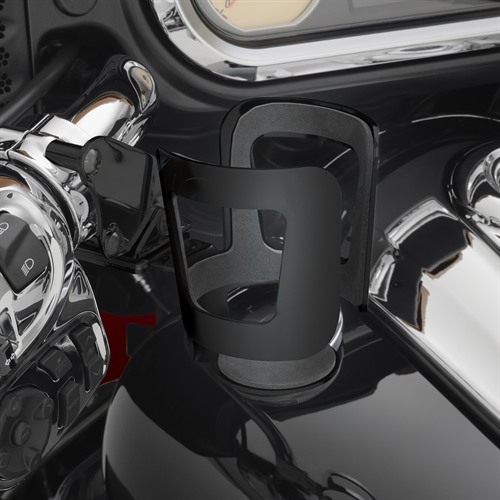 These mount with a custom 1” clamp contoured to fit the 2018 Goldwing case guards, not to the engine or cylinder heads, preventing damage to critical areas in case of a tip over or hard cornering. 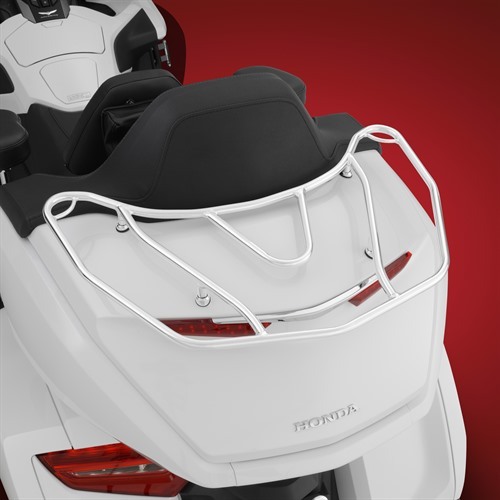 Includes Show Chrome Accessories® proprietary anti-rotation design allowing 360° positioning for ideal rider comfort. All fit the 2018 and newer Goldwing. 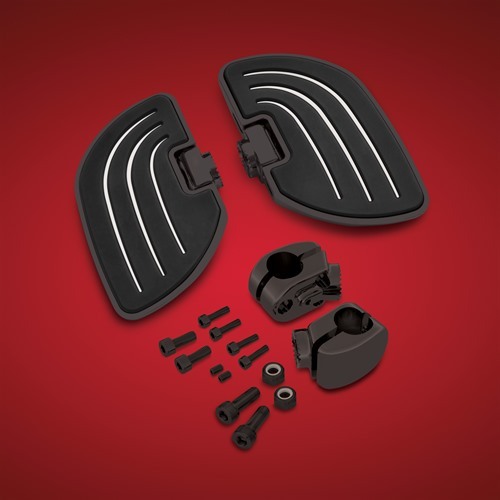 Rice Lake, WI – Big Bike Parts® adds Satin Black Beachcomber Highway Boards to the GL1800 Goldwing in addition to its already popular chrome version. 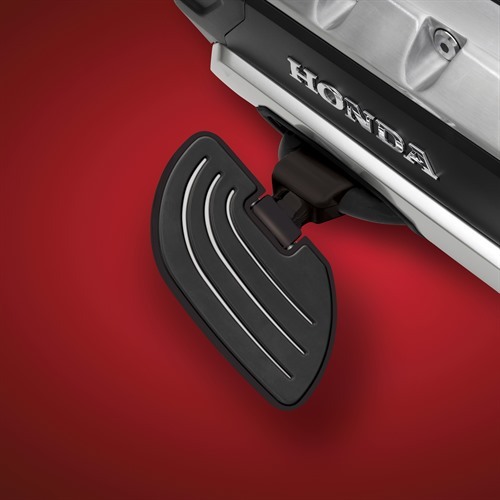 These highway boards use a custom 1” clamp specifically contoured to fit the 2018 Goldwing case guards for a secure fit. They do not mount to the engine or cylinder heads, preventing damage to critical areas if tipped or cornered hard. 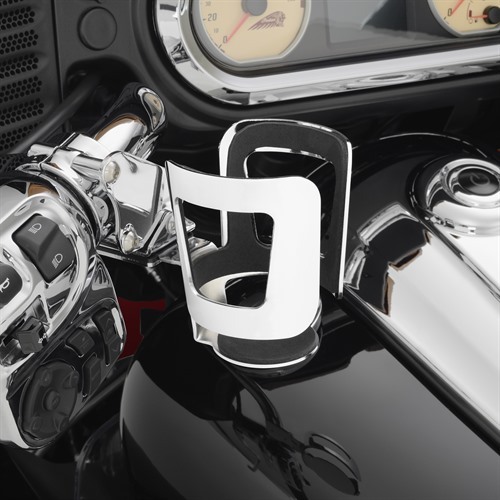 Show Chrome Accessories® proprietary anti-rotation design allows 360° of positioning in 15° increments for rider comfort. 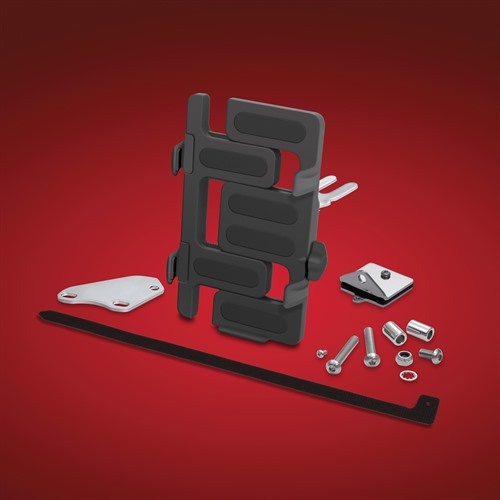 Rice Lake, WI – Big Bike Parts® provides passengers on the standard GL1800 2018 and newer Goldwings a comfortable backrest option, at a truly affordable price. 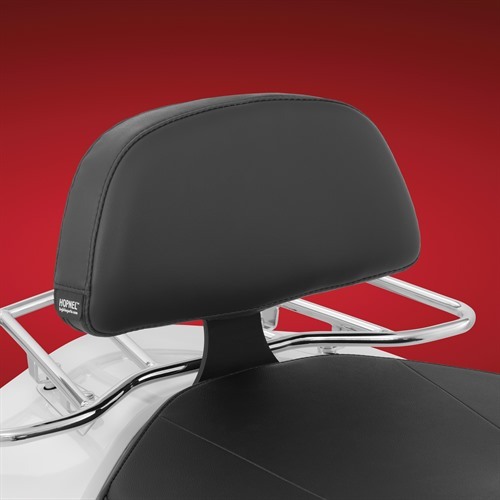 No drilling required, secures to existing OEM passenger backrest mount wrapping under the rear top cover for a clean look. Includes Hopnel™ custom density comfort foam pad that holds up to daily use without wearing down. Made in the USA. 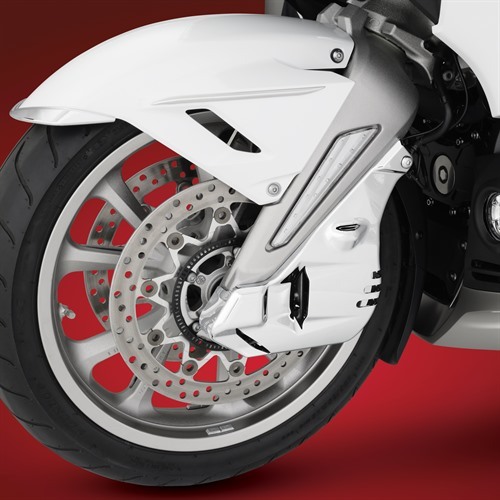 Rice Lake, WI – Big Bike Parts® GT Caliper Covers mount over the front brake calipers providing a true custom caliper cover. The increased aerodynamics around the brakes can minimize the spread of brake dust. Mounts to existing OEM bolt locations with new mounts and hardware. These GT Caliper Covers provide full coverage of the brake calipers and provide a great look with their scoop design and vents. For 2018 and newer GL1800 Goldwings. Available in black and chrome. Rice Lake, WI – Show Chrome Accessories® has been able to significantly upgrade its very popular H7 LED Replacement Bulb to now have 4200 lumens. Which is a 30% increase over its previous H7 replacement LED and still maintain the 6000k bright white color. 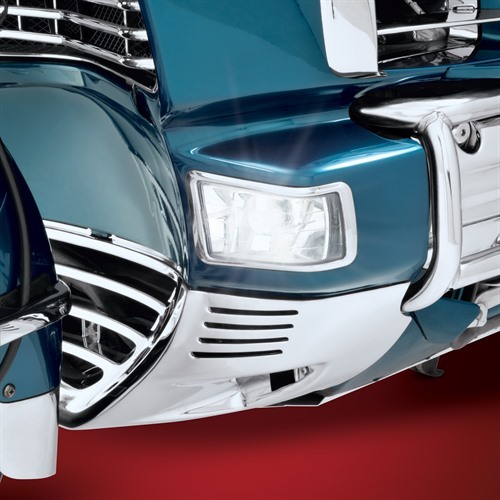 Its anodized silver color looks great in Goldwing headlights, as well other H7 locations. Integrated cooling fan with built-in driver keeps a simple and compact design, making installation a snap. 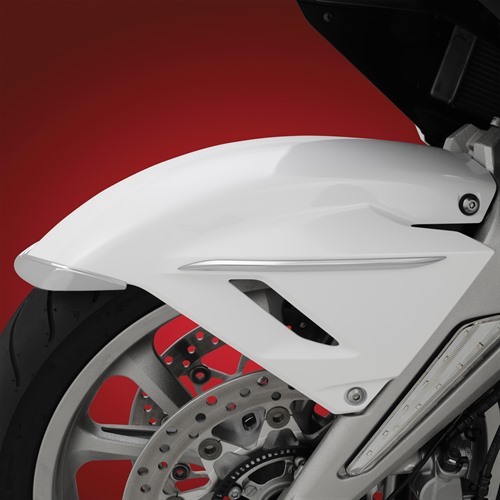 Rice Lake, WI – Show Chrome Accessories® now offers a Front Fender Tip Accent in either bright chrome or satin black for the GL1800 2018 and newer Goldwings. 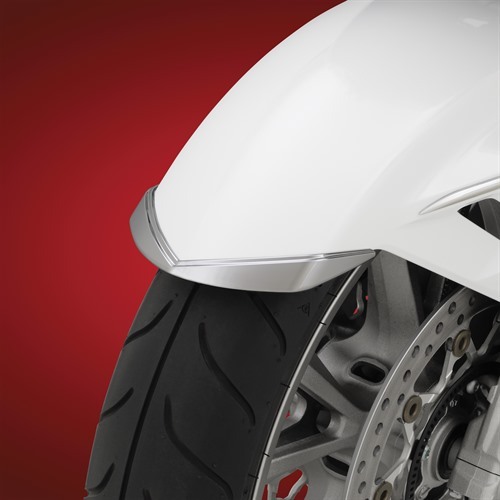 This Front Fender Tip Accent complements the bikes front fender while accenting the bikes clean look. The no drill installation is easy utilizing 3M, high strength, long lasting double sided tape. 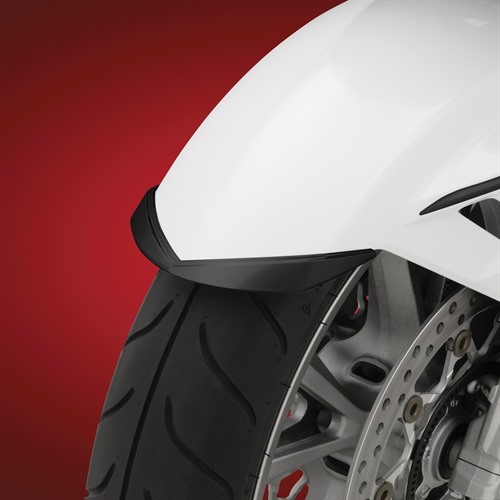 Rice Lake, WI – Show Chrome Accessories® now offers Front Fender Side Accents for the GL1800 2018 and newer Goldwings. The Front Fender Side Accents complement the bikes front fender while offering a clean look without overpowering the bikes color. 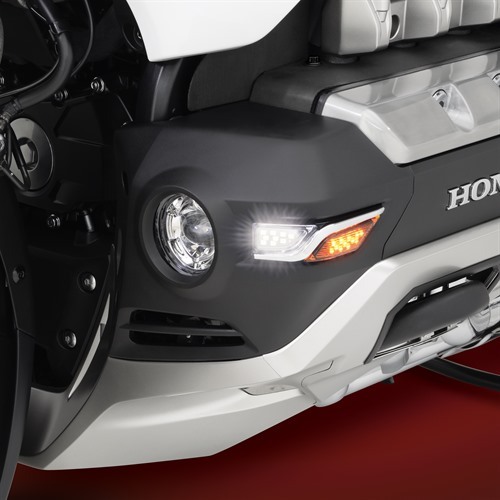 These accents make a great addition to any 2018 and newer Honda Goldwing and Goldwing Tour Models. They are offered in either chrome or satin black. The no drill installation is quick and easy utilizing 3M, high strength, long lasting double sided tape. 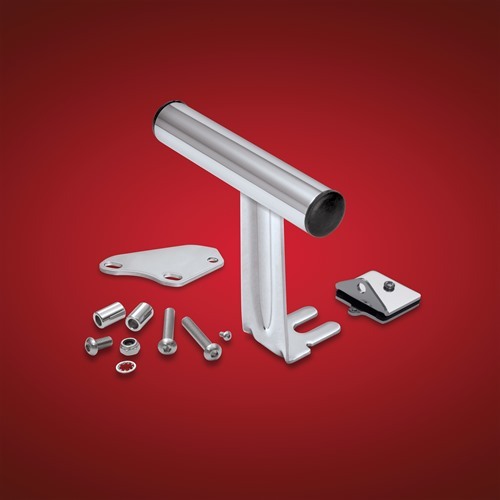 Rice Lake, WI – Show Chrome Accessories® now offers a Brake Switch Block for the GL1800 2018 and newer Goldwings. This satin black LED switch block assembly incorporates two rocker style switches with blue LED’s in each switch indicating when an accessory is active. 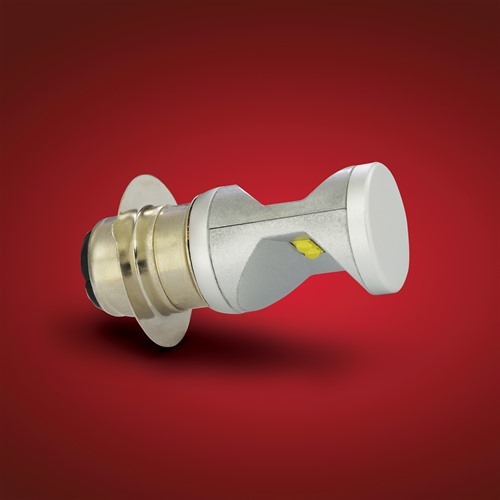 Easily control auxiliary driving lights or marker lights. Mounts on the brake side master cylinder of the bike. 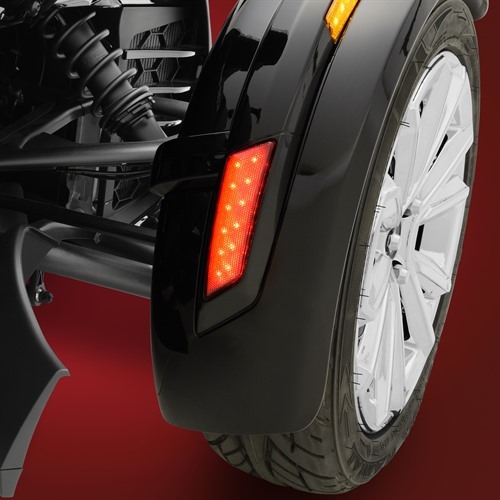 Rice Lake, WI – Research has shown that adding additional functions such as daytime running lights and turnsignals to the new GL1800 fog light only takes away from the light envelope and function of the fog light. 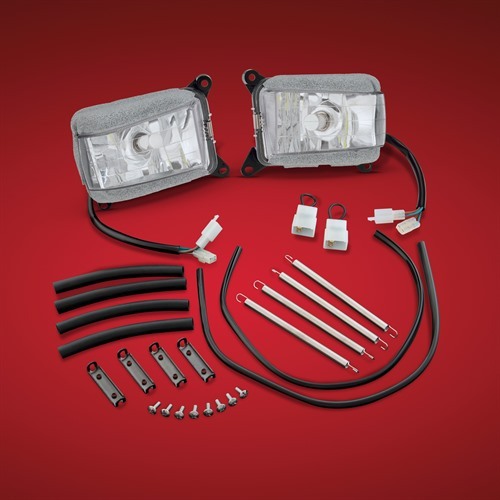 So Show Chrome Accessories® has created a special GT Tour Cowl Light that actually enhances your safety and visibility while working with not only OEM but Show Chrome Accessories® own 52-924 Fog Lights. This GT Tour Cowl Light set mounts to the corners of the lower cowl bringing unprecedented daytime running lights to the front as well as benefiting as a cornering light. Includes amber running lights as well as turnsignals. A subtle chrome accent makes this a decorative enhancement to the front cowl as well as a functional safety accessory. For Honda Goldwing 2018 and newer. Rice Lake, WI – Show Chrome Accessories® now offers a Plug N’ Go Electronic Fuse Block for the 2018 and newer Goldwing. Designed with eleven terminal tie in points which are electronically protected by nine separate relays and fuses. Includes: turnsignal, running lights, brake light, always on and keyed connection points. 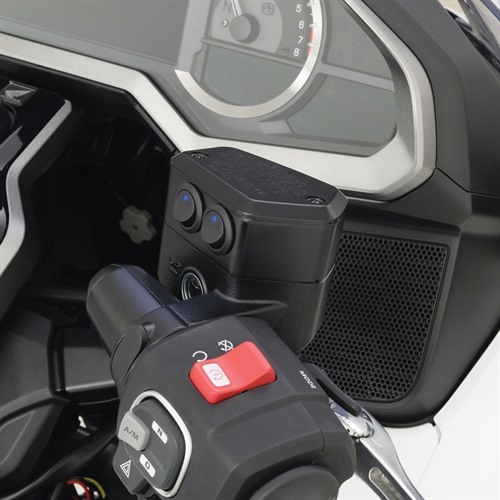 The Goldwing’s electrical system is protected by a 20 amp fuse and separate 30 amp relay to isolate all your electrical accessories from the Goldwing’s electrical system. 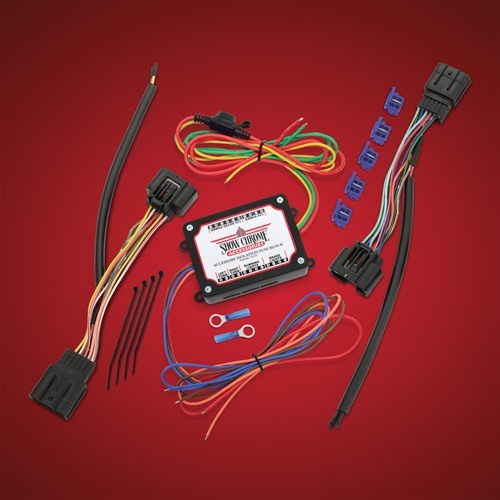 Comes with two sub harnesses with OEM connectors for seamless connectivity. 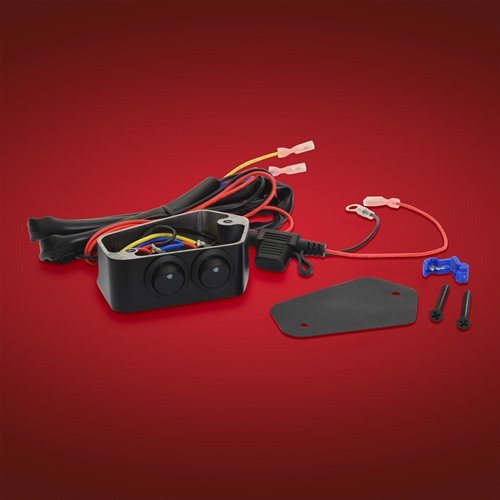 This is a must have accessory when adding electrical accessories to the 2018 and newer GL1800 Goldwing. 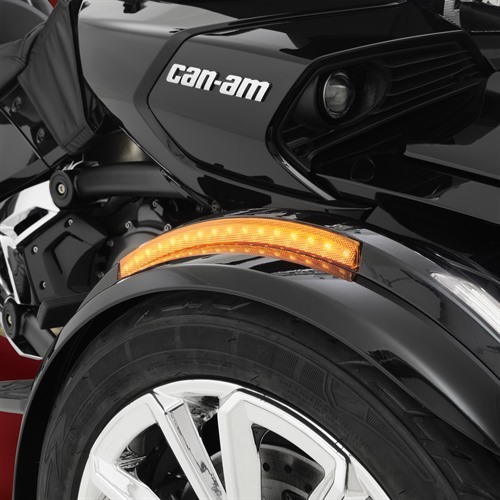 Rice Lake, WI – Show Chrome Accessories® increases the LED intensity of its already popular front fender LED light for the Can-Am by nearly 800% over the original model. While still using the same quality of LED’s, technology has allowed Show Chrome Accessories® to significantly increase the intensity of its Amber LED’s by almost 800% and the Red LED’s by over 300% making these next generation high intensity LED’s ultra-efficient. 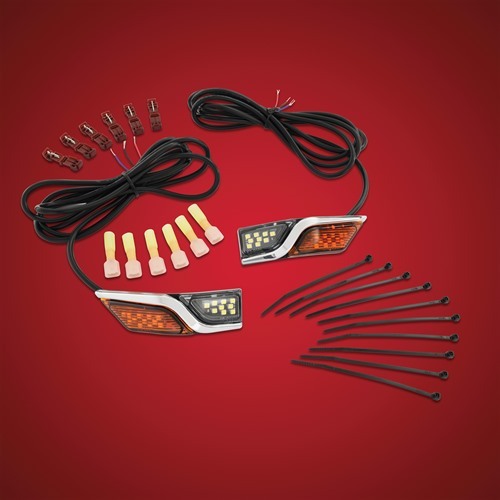 These LED lights replace the OEM reflectors as used on 2013-2018 Can-Am Spyder RS-S/ST-S/ST-LTD/RT-S/RT-LTD/F3-S/F3T and F3LTD. The LED assemblies are sealed for all-weather protection and maintenance free lighting. No drilling required. Mounts to existing wiring with t-taps, no additional components needed. Both are dual function allowing running and turnsignal. 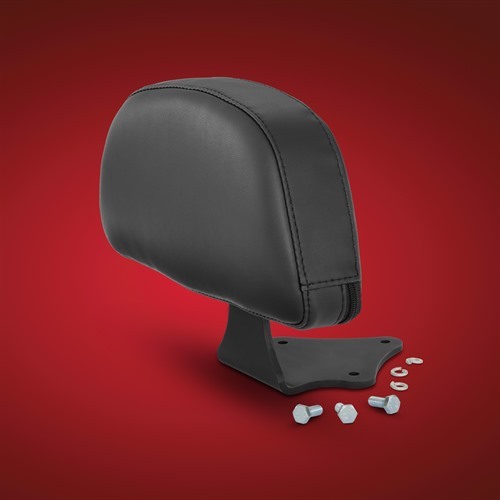 Rice Lake, WI – Big Bike Parts® expands its popular Beverage, GPS/Phone and Gadget Bar Mounts to now cover the Indian. The beverage holder conveniently holds most beverages in its tapered design with a rubber coated inside helping secure the beverage. The beverage holder has been designed for easy installation and removal, just install the receiver bracket and the beverage holder itself can be quickly snapped into place or removed. Available in either Chrome or Satin Black. Also available is a GPS/Phone Mount that expands vertically and horizontally to hold most cell phones and GPS systems using the same receiver bracket, or add a fun Gadget Bar that allows easy mounting of so many available systems to this 7/8” bar. Added security is available with a set screw to ensure it does not walk away while you are parked. 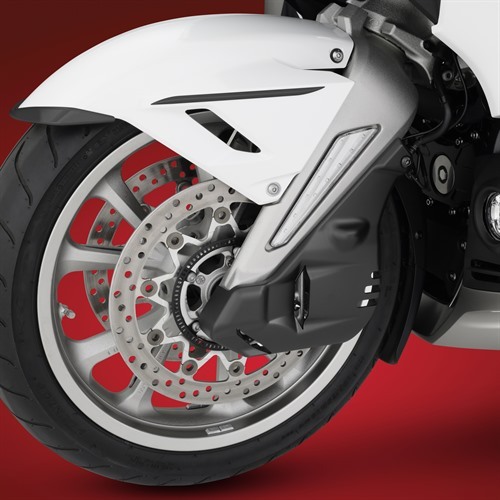 Ideal for the Indian but fits any 32 – 41.5mm on center face clamp spacing as used by Harley, Honda, and Yamaha. 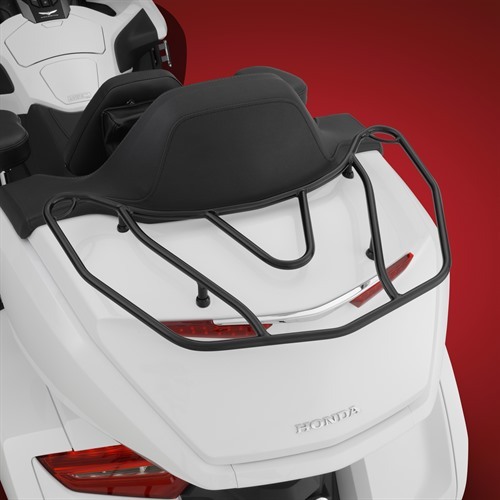 Rice Lake, WI – This GT Tour Rack from Show Chrome Accessories® gracefully complements the natural lines of the 2018 Goldwing trunk. Its generous 22 ½” x 15” overall size will easily accommodate your favorite luggage tour bag as well as allow it to be securely fastened with its no slip corner tie down points. As with all Show Chrome Accessories® drill through racks it comes with custom recessed spacers that are tapered to allow easy matching to the trunk contour to alleviate stress cracking to the trunk lid. Large rubber washers under all spacers, inside and out protect your bikes finish as well as creating a water tight fit. Available in either Chrome or Satin Black.